hi there! just a little peek at what my art star booth set up looked like. i have only done two other events like this so far, so i still have quite a few kinks to work out as far as display, etc., but it's getting there. many of you have inquired as to whether the items in the previous post will be available in my shop. 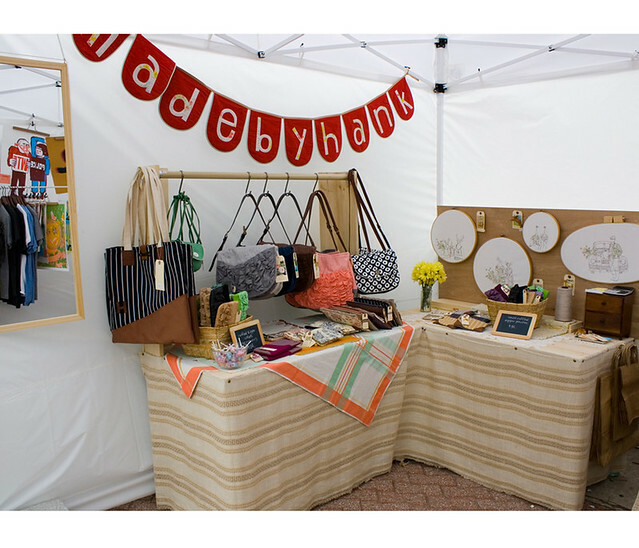 i made those items for the art star craft bazaar this past weekend, and since it was a pretty soggy weekend (so glad i sprung for the really good tent! ), i do actually still have some of the items, and will be listing them in my shop throughout the week, as i am able to finish up the photos. I can see your embroideries there, too. Will you be selling some of them as well? I'd be very interested, I love them! so cute! Very professional looking! I think it looks great. Totally freaking abt my own Renegade set up should I make the cut - can u share your tent maker w/out feeling like you're shilling? Sad Art Star was rainy. My experience is if MBH's at a show, you're selling out.